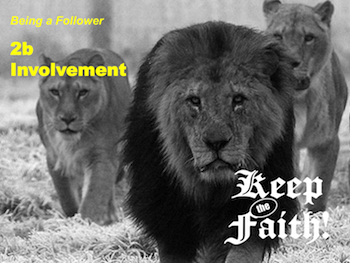 After self-examination, the second direction of growth while being a follower is "out right," fellowship. You must learn how to reach out to your family. Fellowship requires attendance, involvement and belonging. Lee DeForrest was best known for being the "Father of radio." In 1926, he said this about a new invention called television. "While theoretically and technically television may be feasible, commercially and financially I consider it to be an impossibility, a development of which we need waste little time dreaming." Of course, DeForrest was badly mistaken and television quickly became one of the most influential inventions of our time. With the age of television also came the age of couch potatoes and mesmerized observers. Through television and movies we could live our fantasies without ever leaving our seat. Actual involvement became unnecessary. Sadly, this couch potato mentality has also effected the church. Too many older Christians are content with passive church attendance and allowing Christianity to happen to them. God is not pleased. In Deuteronomy 30:19, God inspired His people into action by putting before them a list of blessings and cursings. In Matthew 25, Jesus does the same thing with the subject of involvement. Read the parable of the talents as recorded in Matthew 25:14-30. Notice the blessings that a person receives according to their level of obedient involvement in the work of the Master. Adventure - In verses 14-17, the master divides up his property among his trusted servants. To each he gave "according to his own ability; and immediately he went on a journey." (verse 15) Perhaps the most interesting part of these verses is what they do not say. The master placed them in charge and then "immediately" left them alone to do with the property as they saw fit. In many ways God does the same for you. He has entrusted you with abilities and wealth beyond compare. The blessing of adventure comes from dreaming and accomplishing the most that you can before the Master returns. Imagine what you can accomplish with all that you have been given. Don't be afraid to dream. Only two of the three servants enjoyed the adventure. The third was severely punished for his lack of initiative. Enjoy the adventure. Acknowledgment - In verses 19-23, the master returns and gives praise to the two adventuresome servants, "Well done, good and faithful servant...." (verse 23) More than any other words, this should be the acknowledgment you want to hear from the mouth of your Father. He loves you and He wants you to succeed. To do this, you must be involved. Advancement - Because they involved themselves in the adventure, the master gave them acknowledgment. But the blessings did not stop there. In addition to being acknowledged, they also received advancements. "...you have been faithful over a few things, I will make you ruler over many things. Enter into the joy of your lord." Can you be trusted with the simple blessings of this life? Are you willing to do the most with the abilities and possessions that God has given to you? If so, God will entrust you with the marvelous blessings of Heaven. Be involved now so that you will be included then. What would you do if God left you in charge of His richest blessings? Would you enjoy the adventure or would you lazily hide your gifts out of fear? The lazy servant was punished severely for his inactivity. It was not so much that he did the wrong thing as it was that he did nothing at all. God is your Father and you have been left in charge. If you do your best, He will be pleased. If you do nothing, He will not. Join the adventure. Get involved. Consider your talents. God gave you them for a reason. Your greatest effectiveness will come when you allow God to work through you in the areas for which He has prepared you. Ask the church leadership for areas that are in need of more involvement. Find a job that you enjoy doing and you will never think of it as work. Before getting too deeply involved, make a list of the areas in which you would most like to work. Do not overcommit yourself or you may "burn out." Make it known that you want to be involved. "But he who had received one went and dug in the ground, and hid his lord's money. After a long time the lord of those servants came and settled accounts with them. "But his lord answered and said to him, 'You wicked and lazy servant... you ought to have deposited my money with the bankers, and at my coming I would have received back my own with interest. So take the talent from him, and give it to him who has ten talents... cast the unprofitable servant into the outer darkness. There will be weeping and gnashing of teeth.'" As with the blessings that came to the servants who got involved, there are cursings for the one who did not. List three curses that you see the unfaithful servant receiving. This passage indicates that fear led the unfaithful servant to avoid involvement. List three fears that you have which could hold you back from getting involved. The least the unfaithful servant could have done was gained the master interest. What is the least God has the right to expect of you? Why did the ten talent man get the unfaithful servant's talent? What application is there for you? Also, don't forget the first four lessons in the "Being a Follower" section! Back to Top of "Keep the Faith! Being a Follower 2b"